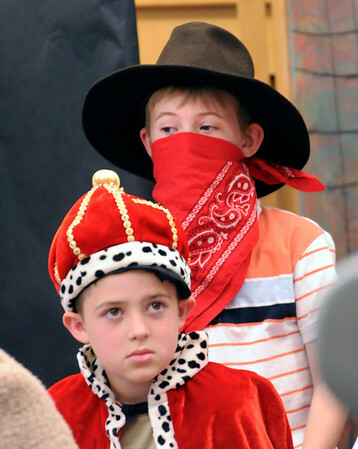 Salisbury: Jared Cepiel, 7, front, as the King, and Max MacKenzie, 8, Evil McKnievel watch the dress rehearsal of the short play "The Legend of Slappy Hopper" at Salisbury Elementary School, the two being in other plays. Students in Bethany Marshall's second grade class are putting on several Tall Tales to present to parents on Friday. Bryan Eaton/Staff Photo Newburyport News Wednesday May 13, 2009.